We got up and moving better than the day before and we decided to head for the Arc de Triomphe as in the tour the previous day, we didn’t actually get up close and personal with it. We caught the metro and came up right next to it. With about 132 thousand other people. (Again, room for exaggeration) Again it was a stunning day for weather so we really took our time. Cass and I stood next to the road watching for a crash which apparently happens once every 30 minutes (it’s about 9 unmarked lanes with traffic lights on the roads that enter but they all seem to go green at the same time. And the people on the roundabout seem to sometimes be giving way to the people entering.) We took our photos then headed for the tunnel that goes under the chaos that is the road above us. The Arc does become more impressive when you stand right next to it. It has the memorial to the unknown soldier which commemorates all the soldiers that served in WW1 and 2. We sat in the area under the Arc for quite a while actually, soaking up the sun and waiting for a crash (that never came) until we decided we were done. Actually, i would like to mention that the Arc de Triomphe was built by Napoleon for his victories over the Austrian Empire. Written on the walls is all the battles in towns that he fought and won. Now THAT is an interesting monument. That is something worth spending a small amount of money on. That is my idea of a monument. Something that really lets people know that you are the greatest. All about the ego. 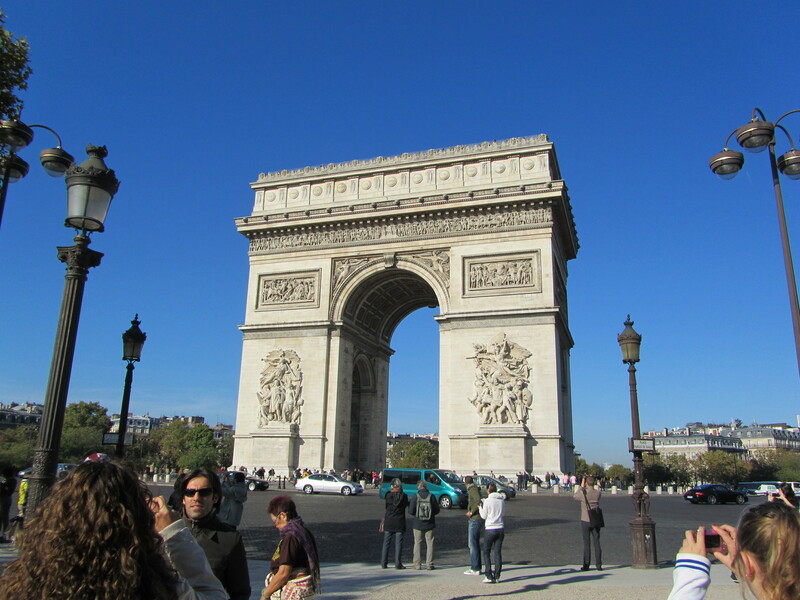 When we finished there, we headed back through the tunnel and started walking down the Champs Elysees which is the second most expensive street in Paris. Again there were so many people but it just kind of added to the atmosphere at bit. Actually, who am I kidding, get rid of them all. They are such a nuisance. We were walking down for a while looking at the watches selling for 25000Euro when we came across the Peugeot store which we had a look in for a bit and then just a few doors down was the Mercedes store which had a few more cars plus an engine that was in a display case and actually spinning at a very slow rate so people could see how it all works. We continued down the Champs Elysees, stopping once for a break and several times for photos, before arriving back next to the Louvre. Chris, dad and Cass went in and saw the Mona Lisa via the side entrance of the Louvre while mum and I sat out in the sun. 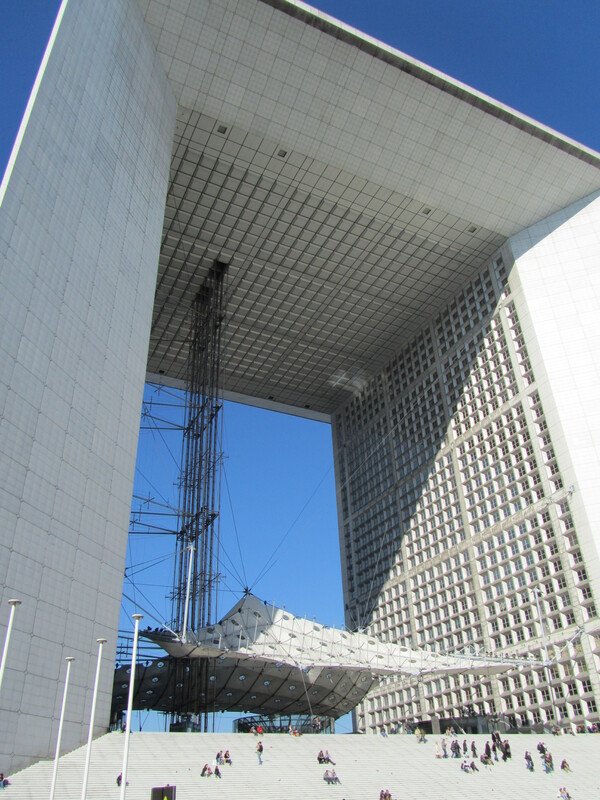 When they came out we decided to go off to La Defence again. This was the place that dad and I had come to collect the keys for the apartment and we wanted to show the other the size of the place. When we arrived we were all pretty hungry so we got some food and sat down and ate it. Actually this took up most of our time there as neither Cass or mum were in the mood for shopping so we headed outside into the plaza. This was worth seeing and not exactly what you imagine when you think of Paris. Paris actually has the largest financial district in Europe and this is the centre of it. There are ultra modern skyscrapers all around you including a huge arc of office buildings. I think it was made to resemble the Arc de Triomphe. Well it was the same shape and colour. It was actually a really refreshing change to be in this area. Most of what we had seen was old towns, dirty inner city suburbs and the country side. This was a huge, open, clean place that felt like it was from some kind of sci-fi fantasy movie. Like some of the castle we go to seem made up and fake, this place was the same but because the buildings just seem too futuristic to be real.